Monday, February 11, 2019, – 8:00 a.m.
Purpose: Provide an opportunity for undergraduate students to demonstrate higher order learning skills and synthesis knowledge of the art and science of rangeland management. Eligibility: Individuals-Any undergraduate student currently enrolled, or enrolled in the prior semester, as a full-time student may compete for individual honors. Teams-Team scores for each university/college/school will be the sum of the three highest scoring individuals. Students must be registered for the annual meeting and wear their name tag to the exam. Students without name tags will not be admitted. 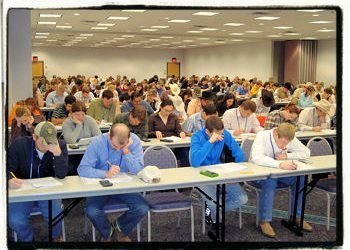 Students are highly encouraged to be present at the door to the room where the exam is being held at least 15 minutes prior to the start of the exam. The length of the exam is 120 minutes. Hand-held calculators are allowed; those that make sounds are not allowed. Each student should bring plenty of pencils. Books, notebooks, and extra paper will not be allowed into the exam area. Cell phones and other electronic devices (other than calculators) must be turned off during the exam. The exam is divided into six categories: Range Ecology (60 points), Grazing Management (60 points), Range Improvement (60 points), Range Regions (30 points), Range Inventory and Analysis (60 points), and Multiple-Use Relationships (30 points) for a maximum score of 300 points. 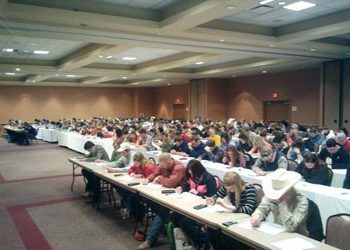 The exam consists of multiple choice questions in the six areas; these questions are intended to assess higher order learning skills and synthesis knowledge of the art and science of rangeland management. In addition, problems are given in the grazing management, range improvements, and range inventory and analysis sections. Questions are selected from material submitted by university faculty members, government agency personnel, non-governmental organizations, industry personnel and ranchers. Coaches, students, and other interested persons can view the exam after completion of the 120 minute time period. Copies of the exam with the correct answers will be spread out over the tables. Following this open viewing of the exam, there will be a Coach’s Critique. Here, the questions on the exam are discussed. A simple majority vote of the coaches present is needed to remove any question or change an answer. This is the only opportunity to challenge a question before grading occurs. Examination copies are not allowed to be removed from the exam area or distributed to schools. Likewise, no copying of questions will be allowed during the open viewing period. Old exams and newly submitted questions make up the test question bank and are kept confidential (similar to the plant mounts). Reference material for the URME include range textbooks such as those by Holechek et al., Heady, Stoddart et al., Heitschmidt and Stuth, and Vallentine. Journal articles and other reference material may also be used. Copies of the exam are printed in English and Spanish, if requested by URME coach(es) by December 1. Team and individual awards will be given for the first five places. In the event of tie scores for team or individual places, duplicate awards will be given. Each contestant will receive a certificate. CPRM: The CPRM exam requirement will be waived for the top 10 % of students who pass the URME if they apply for CPRM within 5 years of qualifying.